Out My Front Door: Giveaway Winner, and Crystal Beauties~And post 100! Giveaway Winner, and Crystal Beauties~And post 100! First off I want to announce that the Round Robin giveaway is over! The lucky winner is Amanda Pierce! Thank you to everyone for participating. Hopefully another giveaway can be done soon! Winter is not a winter wonderland, but sometimes it turns over and shows you its gems. At those times it does feel worthwhile; speaking from the point of personal enjoyment anyway. And now for the surprise photos that I was so gleeful to catch (not that it was hard, only in that I realized it was there to be taken)! I believe this tree is a western beech. I looked up, saw them, and was just SO happy! Any sign of spring and I'm ecstatic! This is the apricot tree that had those blooms I took such a lot of pics of last year. I can't wait for it to bloom!!! So that was the surprise. Not sure if you're as thrilled as I am--but I'm a warm-weather oriented girl, and I'm a ravening gardener to boot. Speaking of which, my neighbor gave me a big bag of glads to plant!! One of my favorite flowers! I just fawn over them. So beautiful. So not only do I have a big bag, I have an order of them coming in with my rose too! Whoohoo! I'm going to have a ton of glads this year. I'm going to be one happy girl. Well, that's all for now. Very soon I'll be posting more interviews, especially with Laura from LDNaturePhotography! She sells notecards featuring her beautiful photos, ranging from alpacas to seasons, to flowers and insects. She has some really stunning photography. I can't wait to introduce you! Oh, last note--I just realized something fantastic. This is post number 100!! Whoohoo! Wonder what number I'll hit by the end of the year? 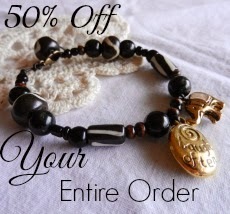 In case you're wondering, the 50% sale is ongoing! I must warn you though, some items are about to run out so you must be fast!